Nearly ten years on from the global financial crisis of 2008, Colin Hay, SPERI co-director, and Tom Hunt, SPERI Policy Research Officer, have edited a book which provides a timely warning as to the dangers still present and building in the global economic system. In The Coming Crisis (Palgrave, 2017) they draw on research on the political economy of growth, stagnation, austerity and crisis, placing each in the context of the wider environmental crisis. Q. Why this book? Haven’t elements been put in place to prevent a crisis similar to that of 2008? One might hope so; but things are not quite so simple. When one analyzes the global economy in any detail, it is clear that very significant risks still exist. That is the simple conclusion of the fourteen leading political economists who have contributed to this work. Each chapter dissects the global political economy in a different way, uncovering and exposing the current sources of disequilibrium and instability. Each contributor offers a distinct perspective on the symptoms of the present moment, reflecting and speculating on the extent to which the world economy has become more dangerous, and less stable, since 2008. The book explores multiple dimensions of the coming crisis through issues such as the contagion effects of financial markets, secular stagnation, widening global inequality, the European migrant crisis, the Eurozone, China’s development and the ecological crisis. Q. Isn’t it rather pessimistic to presume that we are the verge of another crisis? Yes and no. To prepare ourselves for the possibility of a coming crisis certainly sounds pessimistic. But it can also be thought of as the very condition of any realistic optimism. It is better to be optimistic having considered the potential reasons for pessimism than to allow one’s optimism to prevent one from acknowledging the very possibility that there might be things to worry about in the first place. Put slightly differently, optimism sounds good, but optimism today is typically accompanied by a certain complacent naivety. Our aim in this book is, in effect, to stress test the characteristic optimism of mainstream economic approaches. Q. What should we be worrying about? It is at least credible to think that the world we live in today is a more dangerous place and is less stable systemically than it was in 2008. In the economies from which the contagion effects of the last crisis radiated outwards, there has been little if any ‘rebalancing’ of the domestic economy. Such economies remain stubbornly dependent on credit and an overgrown financial sector, with growth once again associated with alarming asset-price inflation. And on a global stage there is little to lift the gloom. The period since 2008 is likely to be remembered as one in which the opportunity for global financial market re-regulation and genuine governance was missed. Our banks remain too big or too interconnected or too correlated in their behaviour to be allowed to fail and yet too big, too interconnected or too correlated to bail. What that means is that a second crisis has certainly not become less likely. And what we also know is that the capacity to deal with such a crisis has been significantly eroded by the nature of the public response to the first crisis – to the point where it is no longer clear what the response to a second crisis might now be. Q. Are there new phenomena that add to the previous risks and our failure to address them? Absolutely, especially in Europe. First there is ‘Brexit’ – a genuine threat not just for the British economy. If Ricardo taught us anything it is that a worsening of the terms of trade between partners hurts all parties. ‘Brexit’, in other words, may be self-inflicted but it is not a victimless crime. And ‘Brexit’ feels to us to be part of a wider dynamic – a tipping-point, perhaps, in which European integration starts to give way to a no less protracted but rather different process of European disintegration. What is also clear – indeed, rather more clear (for very little about ‘Brexit’ is clear at this point) – is that austerity is ravaging Southern Europe and, in combination with the migration crisis, is contributing to the resurgence of a political right likely to accelerate the pace of European disintegration, not just economically but also socially. Q. Why are phenomena such as migration in Europe or the ecological crisis creating economic risks? Both pose not just economic risks, but risks of a more general kind – indeed, both might be thought of as profound humanitarian crises. These dwarf in a way their economic effects. But the economic risks of each are also considerable and should not be understated. Take the implications of the migrant crisis for Greece, for instance. Here, in a country already mired in economic crisis, suffering profoundly with the austerity imposed upon it, the migrant crisis has produced a flourishing of the informal, illegal and illicit economy, with major consequences both for the capacity of Greek institutions and the Greek economy to rebuild and for the deepening of social inequality. If anything the potential effects of the environmental crisis are more profound still – in that they are genuinely global and genuinely system threatening. The escalating costs of adaptation to, and compensation for, accelerating global environmental change alone threaten to push public spending and, above all, public indebtedness beyond what have already proved historically unprecedented and unsustainable levels. It is in this way that these crises are mutually reinforcing – ‘a perfect storm’, as we suggest. Q. And how might we guard against these risks? The book makes the case for a form of prospective precautionary thinking to anticipate and protect ourselves against a coming crisis. What is required is a change in mind-set and disposition. Instead of reassuring ourselves that we have entered a post-crisis period and are now on the road to recovery, we suggest that we should instead be looking out for the frailties and contradictions that remain within the system. We need to identify these and to start to build potential scenarios around them. The book starts to develop some of these, but its contribution is less to provide a definitive resolution of these issues than it is to re-focus thinking on the difficulty and necessity of the task that still remains. That might not sound very optimistic – and in a sense it is not. But it is, we feel, a necessary step in developing the kind of precautionary thinking that can best protect us from the risks present in the economic system. It is, in that way, a first step on the path from blithe and blinkered optimism to a more tempered realism. 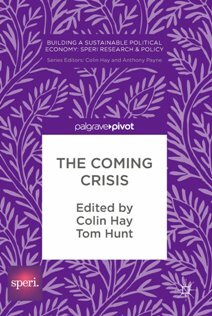 The Coming Crisis is available to purchase in hard copy and as an e-book. All of the book’s 14 chapters can each be individually bought.